Dark. Damp. Dingy. That’s how many laundry rooms of the past are usually described. Often an afterthought when designing a home, washers and dryers were hidden in the basement and only visited on laundry days. But not anymore. These wondrous machines have been upgraded with many features and styles. They have also become centerpieces in today’s modern laundry rooms. The laundry room of today has evolved to match more contemporary living and now serve as functional and beautiful spaces in any home. Follow along to learn more about the journey of the laundry room and tips on giving yours some pizzazz. The process of doing laundry has come a long way. One can easily chronicle the history of washing machines through iconic Maytag ads that highlighted how this technology revolutionized household chores. As washing machines gained popularity they entered the home as featured appliances in kitchens. In the 1930s, basements became the preferred location for washing machines because of their noise. 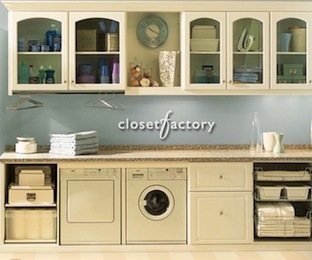 These new, upscale laundry rooms have become a staple in modern home layouts. As such, these rooms are often paired with mudrooms to create multi-functional spaces. These multitasking spaces streamline daily life by incorporating customized features such as sinks, extra storage, coat lockers, pantries, safe havens for pets and more. The laundry-mudroom combo is easily tailored to each homeowner’s lifestyle, making it a fun and practical space in the home. Whether your laundry room needs a simple refresh or a complete facelift, there are simple ways to make it a beautiful space in your home. 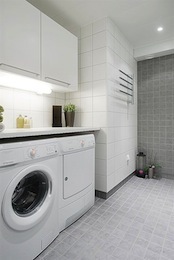 Flooring provides instant gratification in a laundry room. Sealing cement floors with colored paint; add a throw rug to give the space warmth. Laying tile, vinyl, laminate or other flooring will give it a polished look. Paint can take your room from blah to beautiful in just a few hours. Additionally, a fresh coat of paint can bring in color and brighten the space. Storage will give your laundry organization and function. Custom cabinets built for the room help tuck things away while shelves keep things easily accessible. Counter space provides an area for folding laundry and can double as a workspace for gardening, crafts and other tasks. Consider bringing in a table or island for additional utility. Lighting adds a finishing touch to any room. 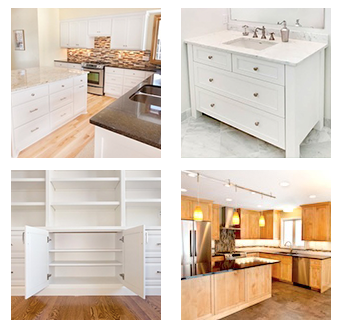 Consider a new light fixture or under-cabinet lighting to enhance workspaces. 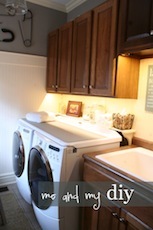 Have You Embarked on a Laundry Room Makeover? Share your laundry room remodeling and decorating tips with us! Leave a comment here, send us your pins on Pinterest or share your before-and-after remodeling pics with us on our Facebook page. Feel free to also send us an email or give us a call! You can reach us at 952-737-7088.